with host, Jane (the puppet) Austen! Inspired by Jane Austen’s novel of (almost) the same name, Senses and Sensibility class is all about falling in love…with the five senses! Love is about as close to a superpower as humans can get. Have you ever noticed that when you’re falling in love, everything around you seems to be in high definition? Colours seem brighter, sounds come through clearer, food tastes more flavourful, and everyday challenges feel less daunting. It’s not just your imagination! There’s research suggesting that love does indeed heighten the senses. Jane Austen’s novels are all about love, so it just made “sense” for us to make her the host (puppet) of our class! 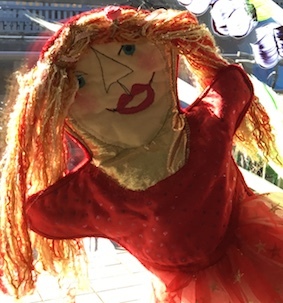 Sadly, as a puppet she doesn’t experience the world through her senses the way humans do. 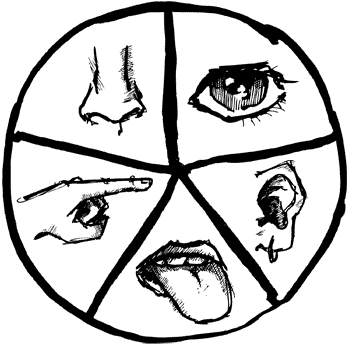 That’s why Jane has asked the Big Kids of Buddings to help her understand them: each class they’ll receive a new mission to see/hear/touch/taste/smell something new, and each class they’ll report back to Jane about what they learned. When all of their missions are complete, Jane might just find love herself…and get back to her senses! With sensory play, there’s much more going on than meets the eye. Sensory activities encourage children to explore and investigate their surroundings, helping to develop a “scientific method” of sorts: forming a hypothesis, experimenting, and drawing conclusions. Testing things out in this way helps children establish their own boundaries and learn to self-regulate, making sensory experiences an essential part of children’s early brain development. Senses and Sensibility class offers children a variety of fun and interesting opportunities to explore their senses: science experiments, circle-time games, field trip adventures, and more! We also hope to encourage empathy for those among us who don’t have the ability to explore the world in these ways. We’re lucky to have use of all of our senses, but it’s important that those who experience the world differently (including our lovely puppet, Jane Austen) are included in all of the fun! on Mondays from 1 – 4pm at Buddings Broadway!